Hounds of Valon; Pointman, Executioner and Tracker. Hey are very charaterfull a special mention for the two handed sword one! He’s smiling… creepy! One thing that I love (and that people just don’t do enough of anymore) is the beastmaster/animal double-figure models that are actually linked by leashes and chains. I used to see a lot of that in WFB back in the 80’s and I always loved it. It’s like a mini-vignette between models – so much character. What about a tiny magnet? Hmm, that might work. But it would need to be camouflaged to something, like a power source, generator, tiny needle weapon etc. You could just put them both on a larger base and make them an all-in-one figure for gameplay purposes. Another option is to magnetize the handler’s hand, and have a replacement to put on him if the rat dies first. If the handler dies first, the rat would just be running around with a chain and disembodied hand. To be frank, these three have been at this stage for a week or so. Just trying to push myself to catch up some deadlines. I totally agree about the pointman, that pose is excellent. Regarding the tracker, you made really creative use of the components that went into his head. For my part, I’ve never been a big fan of that particular rebreather, but with the helmet it looks like it has always belonged. 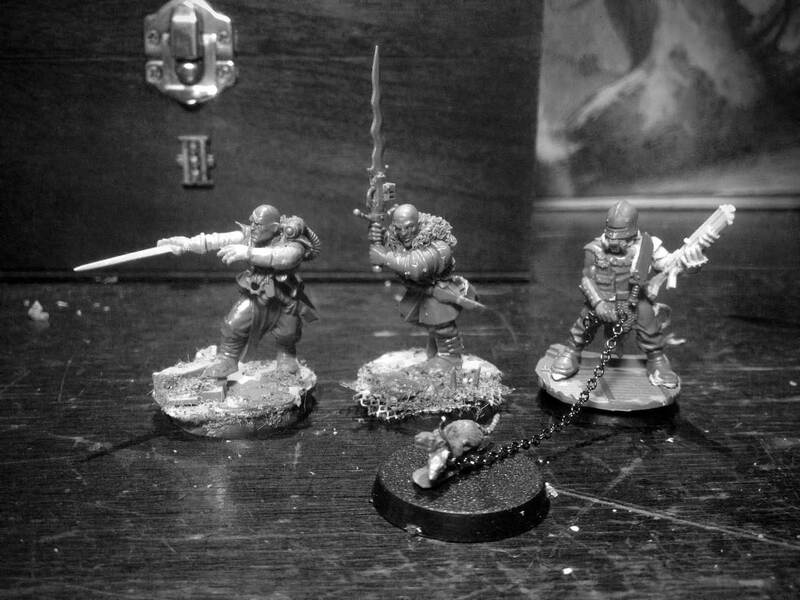 It only occurred to me upon seeing these two latest models that they’re based on chaos cultists. You probably said that before and I had just forgotten, but I don’t know if I’ve ever seen them used so elegantly. Have you thought about making the tracker hold a tiny hook, over which the chain slips? It might not be the most practical option in the real world, but it could fit their look and let you separate the models without the chain trailing a hand. That sounds like a great idea! I’ll give it a try. Thanks B. Wright! Nice tracker!! I guess our invitational entries might be quite similar in spirit. I will need to send some pics next weekend..
Love the subtle ‘power swording’ of the flamberge, is that from the mordheim plastics? Cheers Owlshield! The sword is actually from Greatswords kit. Fantastic stuff! I really love the helmet/rebreather on the rat-handler.